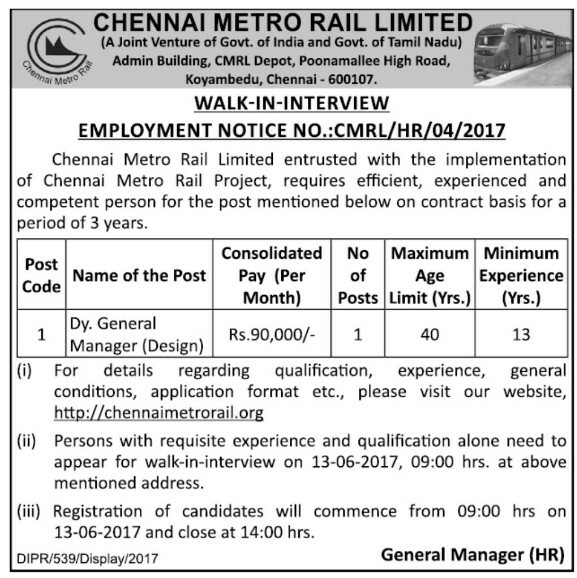 CMRL Job Vacancy 2017 2018 01 Dy. 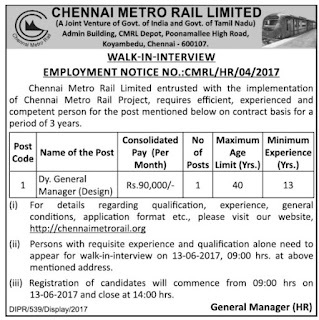 General Manager (Design) Posts| Chennai Metro Rail Ltd Job Vacancies 2017 Download Application Form | CMRLReleased Job Openings Notification 2017 Eligible Candidates can Download Application Through Official website chennaimetrorail.org| CMRL Syllabus, Call Latter, Age Limit, Eligibility Criteria, Application Processes, Walk in Date Details Given below Check before attend walk in Interview. Must be a B.E/B.Tech (Civil) graduate from a recognized Institute. M.E/M.Tech in Structural Engineering will be preferred. Should have minimum 13 years of post-qualification experience in the field of design of civil structures in large infrastructure projects, Work experience in underground/elevated stations of Metro / Railway Projects will be preferred. Should have working knowledge in structural design analysis softwares like STAAD Pro, Wallup, Plaxis, SAP etc.Should have experience and knowledge in dealing with multiple design interfaces associated with large infrastructural projects. Selection Procedure: The selection methodology comprises two-stage process, interview followed by Medical examination. The selection process would judge different facets of knowledge, skills, comprehension, aptitude and physical fitness.